Dr. Guillermo Mendoza presents hydraulic modelling, economic justification principles, and shared vision planning applied in Udon Thani to develop a green infrastructure master plan to build urban flood resilience. On 30 Oct 2018, ICIWaRM participated in a workshop in Udon Thani, Thailand on developing green infrastructure to build urban flood and drought resilience. Organized by the International Water Management Institute (IWMI) and estudioOCA, the workshop attracted more than 40 participants from four cities and planning departments in Lao PDR and Udon Thani. Udon Thani is a rapidly growing province in Thailand, with a total population of 1.5 million people, 150,000 of which live in the municipal city center. With past ICIWaRM assistance, Udon Thani decided to develop a green infrastructure investment strategy using shared vision planning to incrementally buy-down risk within the central ring road of the city. A Master Plan was developed whereby Udon Thani stakeholders have agreed to a green infrastructure investment strategy to reduce flood risk that was evaluated using a decision support interface, a Storm Water Management Model (SWMM) to simulate hydraulics and the application of shared vision planning to guide the analysis. Output from an Udon Thani Public Works Dept. 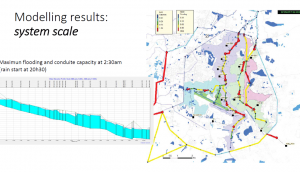 Storm Water Management Model of Udon Thani’s flood water routing system. 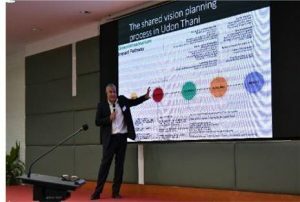 The workshop was structured to share lessons learned from past and ongoing efforts in the use of shared vision planning to collaboratively plan for urban flood and drought-resilient infrastructure, and to point the way to replicating the Udon Thani successes in Lao urban areas. ICIWaRM has been engaged with the city of Udon Thani since 2013, with funding from USAID, USACE, estudioOCA and the Rockefeller Foundation, among others. Follow-up workshops, which will also engage planners from Lao PDR, are planned for 2019.